Germany, 1943: Rosa Sauer’s parents are gone, and her husband, Gregor, is fighting on the front lines. The 26-year-old leaves war-torn Berlin to live with her in-laws in the countryside. But the SS conscript her to be one of Hitler’s tasters: Three times a day, she and nine other women go to his secret headquarters, the Wolf’s Lair. 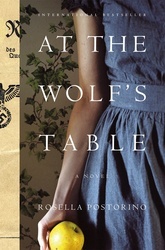 Forced to eat what might kill them, the tasters divide into The Fanatics, loyal to Hitler; and women like Rosa who insist they aren’t Nazis, even as they risk their lives for Hitler. As the war worsens, secrets and resentments grow among this unlikely sisterhood, and one of Rosa’s SS guards becomes dangerously familiar. It becomes clear that Rosa and everyone she knows is on the wrong side of history.